I have grown in ways I could not otherwise have imagined or anticipated. And it’s been the best year of my life. Some people live their entire lives, never having the opportunity to know themselves. I felt like I’ve had a pretty good understanding of myself, for awhile. But the past 19 months, and particularly these last 12 have enabled me to see much more of myself. I was looking at a lot of surface stuff for far too long. Taking stock in what I thought I saw, rather than what was behind all of that. And asking and answering questions that didn’t matter. It wasn’t until I started to give myself time and space to think, that I started making progress. And it wasn’t until I started to focus my writing, daily, that the speed at which I progressed increased multi-fold. When I was in high school, this thing called the internet was all the rage. Thanks to email and AOL IM, my sister and I inadvertently produced more than our fair share of busy signals for people calling our house. At the time I also started to write on a BBS/message board (hosted by the Section 2 Harrier site, created and moderated by a nice guy named Jon Broderick) that kept (and continues to keep – go Jon!) all cross country / track and field fans in our corner of New York State apprised of important news. It was also a very cool forum where some decided to talk trash. I took it as an opportunity to share ideas and reflect on things I was seeing, and I was exposed to a new way of developing meaningful relationships. I have given credit for awhile now to email, instant messaging, and the section 2 harrier message board for helping me to develop my writing voice at that time. The hours I poured into emails and online conversations enabled me to develop my identity and to engage in meaningful conversation with others. Writing was my outlet to the world. I finished out high school with a healthy understanding of myself, ready to move forward. And I continued writing in the early days of college. Until I slowly turned my priorities elsewhere. Though a move back to America last year (May 2013) was a natural segue* into a return to regular writing dates. From the beginning, I came down with a serious case of “writer’s block” or was giving into my perfectionist tendencies in those early days back in America. Maybe I should have accounted for that after a decade away of sharing writing like this with others? It was then I realized I needed a new space to find my voice. Here, a new blog, seemed a worthy spot to do so. Not long after my irregular blogging began, during my time at the East-West Center‘s Asia Pacific Leadership Program (APLP) in Honolulu to close out 2013, we all had to put together a portfolio, a collection of mostly written reflections – thoughts about the past, present, and future. It was time to make something with a real timeline, deadline, and commitment. 4 months and 100 pages later, I was working off a bit of momentum. But 2013 ended and 2014 began in the midst of uncertainty. Uncertainty doesn’t need to be a negative thing, and hindsight is 20/20, but much of my problem was my choosing fear over love. Sure, it was masked by “uncertainty.” But I was still a bit uneasy about my identity. I was trying to please someone I loved, but how could I please her without communicating, without pleasing myself, and by not even being me – that guy she loved. I was going about it in all the wrong ways. I knew there was a problem. Actually, I was drowning, but it looked like I was a pretty good swimmer. I was doing my best to figure “it” out. And I was failing, miserably. Ultimately it just looked like I was a problem that needed fixing, not there was a problem that we needed to fix. It takes two to tango, but I’m not sure either of us really knew how, we didn’t really practice, and we had no teacher. I felt very alone. Maybe she did too? I tried to reach out. But my message must not have gotten through to her. And her messages? Well, I wasn’t getting them either. Missed messages like ships passing in the night? I knew I couldn’t solve old problems in the same ways and I thought I was doing everything that I could. But it wasn’t working so I had to keep trying. I was lost, but I found trust in my notebook and bic pen. It went far beyond my regular note-taking, by taking notes of deeper thoughts and feelings and fleshing them out until I could better understand whatever was on my mind. Writing was no longer an outlet to the world, but an inroad into my soul. Have you visited lately? It’s a pretty deep place. Terrible one-lines aside, these deep conversations that extended into the depths of my soul, mediated through writing, have been a significant reason why I’ve had an incredible year. I’m sure it’s not for everyone. And it won’t necessarily help you in the same way it helped me. But at a time when I needed greater clarity, it was the writing that was there for me. No person, no matter how close they were to me – my parents, my sister, my closest friends – could help me. This one I had to start on my own before I could get back to a place of confidence, a place of greater understanding, a place where I had regained my identity. It’s the easiest thing in the world to hold yourself back. It harder to realize that you are usually the one doing the holding. Whether it’s beliefs, behaviors, or certain actions that are self-limiting, we can do a number on ourselves often thinking that if external circumstances would change, things would be better. How might you make a difference in the lives of those that matter to you by starting with yourself? When will you set aside some time for a constructive and thoughtful conversation with yourself? Find that time and space to work out your thoughts? To rediscover – perhaps even discover – things about yourself you haven’t seen in awhile (or have never seen)? What questions are important to think through? What questions should you be asking of yourself? What suggestions might be made? Be the sounding board that you need the most. But remember, it will only work if you choose to be honest, to lay it all out there, and to lead with love, not fear. When it comes to the things (or thing) that matters most right now to me, I’m certainly not out of the woods. But these days I know myself more than ever before. And, as a result, I’m much better prepared to deal with the uncertainty. So, goodbye 2014. Thank you for being so good to me. And 2015, I’m eager to see where we go together. *So, when segway came up as a misspelled word, I did a little investigating on how to write the word that I know to indicate something related to a transition. Apparently this word is an Italian derivative and thought pronounced “segway” is written “segue.” You can take a look here to see what some have to say about this. 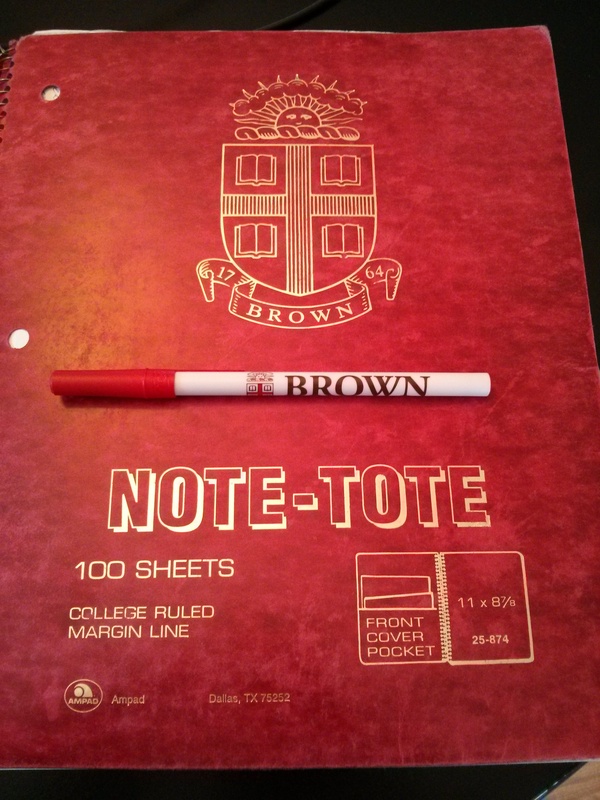 Today’s photo comes from my personal collection – the notebook and the pen that started it all this year. I thought it was about time to make sure this one went to good use. It served me well in the early writing days this year – from ideas to The Oliver Chronicles and beyond. This entry was posted in 60 Day Challenge and tagged best year of my life, challenges, communication, confidence, conversation, daily writing, have never seen, haven't seen in awhile, identity, lay it all out there, love not fear, Questions, running, segue, segway, uncertainty, understanding, writing. Bookmark the permalink.